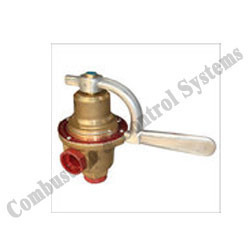 Combustion and control systems Mumbai offers sensitrol oil valves. Our exquisite array of Sensitrol Oil Valve is engineered using optimum quality raw material. Designed in compliance with international quality standards. Capacity: 14 to 635 litres/hr. Application: Micro-metering of oil to burners with 100% shutoff capability. Sensitrol Valve is a tight shut-off valve with precision V-oil port for micro-metering and uniform flow of oil through-out the 180 degree sweep of the control handle. Sensitrol Valves are tight shut-off valve to prevent dribbling oil into burners during shut-down. It also permits the convenience of shutting off the burner without disturbing the Sensitrol's limiting orifice setting. Sensitrol valves are available in 6 sizes depending on oil flow requirements. Looking for Wesman Burner Spare Parts ?